I thought I was picking up a little light reading, but no. Dietland is social commentary, and I can’t make up my mind about it. Plum Kettle is fat. (It’s okay. I’m allowed to use the f-word.) At 300-something pounds, she lives a quiet, private life in Brooklyn answering fan mail for a teen magazine. Girls write to Kitty with all sorts of problems – they’re cutters, anorexics, small chested, acne-ridden, etc – and Plum, under the guise of Kitty, responds with positive, affirming advice. She does this in the privacy of her own apartment or in a nearby cafe. She does not have an office in the media building… she’s not visually pleasing to look at, after all. One other thing – Plum has weigh-loss surgery scheduled for October. In a short four months, she’ll be snipped and reshaped so her inner, skinny, happier self can emerge another nine months later. The countdown is on. Yet Plum’s life is upended when she becomes engrossed in an underground community of women who outwardly reject the socially acceptable rule that fat is bad and skinny is best. Sidebar: As someone who used to be 70 lbs. heavier than what I am now, someone who was grossly overweight in middle and parts of high school, someone who nearly wrecked her body in later high school and early college from an eating disorder, I am highly invested in and concerned about the ways women are portrayed in media. I, too, reject the socially acceptable rule that fat is bad and skinny is best. This is where the book goes nuts. While I was rooting for Plum to love herself as she already was, I was also rejecting the uber-feminist message that all men are pigs and only want skinny girls. I kept waiting for an honorable guy to enter the picture, but no such thing happened. 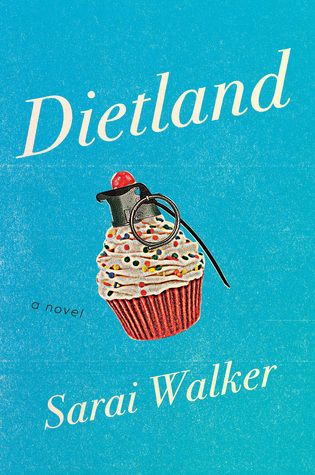 Dietland is a revenge fantasy, an answer to “what if fat women everywhere fought back against the name-calling and rejection?” But it’s not just about weight. It’s about sexuality and race and intelligence. It’s about women as second-best and man’s personal property. It’s… a lot. I liked the book, and I didn’t. I applaud the effort, but it went too far. It embrace the freedom women have to do as they please, but I reject the idea that embracing freedom requires violence and isolation. Yes, something must change. We cannot tell our daughters that fat is bad and skinny is best. But how best to accomplish that? I’m still brooding over a blog post about weight. Ever since that podcast (“Tell Me I’m Fat”) I’ve been stirring. Dietland only made it worse.